My brother just arrived and gave me three gadgets, whose brand is Jamm. 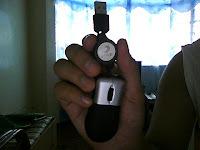 I already posted a review about the MP3 Player, and now, I want to give a brief review of the mouse. This optical mouse is very portable, with a neat roller for easy keeping. It is much more like a regular mouse except that it is too small. This mouse is literally a mouse size. It is too small that I think it is only good for kids. I tried using it and it functions well. But my hand really aches after a while. If you are only going to use the mouse for typing purposes or for a few minutes, then I think this mouse is great. But if you are planning to use your computer or laptop for a long time, then I advice you to get a bigger one.